I’ve been a Simple Plan fan for ten years. It’s a surreal feeling. Nothing could have prepared me for the love I would come to feel for this band. When I was younger I used to fall in love with songs. I still listen to *NSYNC’s Bye Bye Bye an embarrassing number of times. And, I’d sing those songs and play them for ages, or watch the videos on Video Hits, Rage, Channel [V], but I wasn’t so much into bands. I was very much into pop music at that time. *NSYNC, Backstreet Boys, Human Nature, Spice Girls, etc. And anything that my parents played; Kenny G, Bob Dylan, Aretha Franklin, John Farnham, etc. And then this ‘small’ band from Montreal began to wind its way into my heart. The first time I experienced them was on one of those music shows in the guise of their music video for Perfect. One day that August of 2004, Dad was flicking through the channels when I noticed the band playing on a roof and wondered what they were doing? The song itself caught my attention. And true to trends at the time, I fell in love with the song, bought the single and played it to death in my car. However, I gave very little thought to the band itself. Relegating it to the back of my mind and enjoying the music. And then I proceeded to play SNGA to death in my car. From there, it all went downhill…not really. My love for the band just went crazy. 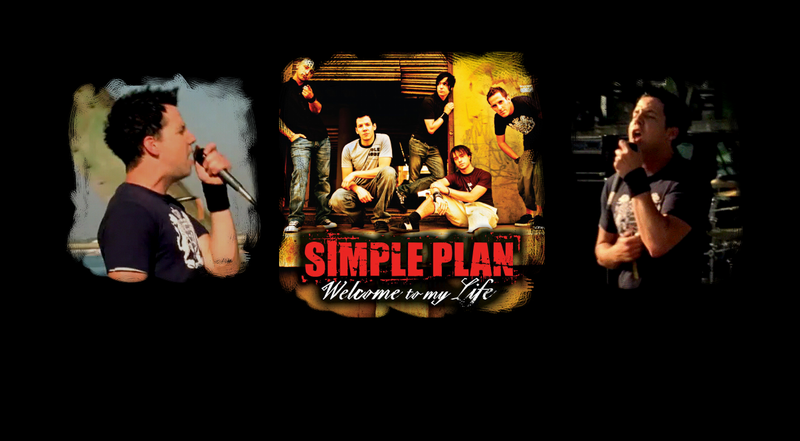 I joined SimplePlanOnline.com and started to write fan fiction about the band [which is still ongoing – I’ve got over 50 stories, not all SP but the majority are]. And, of course, fell in love with Pierre Bouvier. Back in those days TV Hits and Smash Hits magazines existed, and I bought them for the Simple Plan posters. [And Good Charlotte too…because ironically I heard them before I ever heard Simple Plan.] Should’ve seen my bedroom. Posters all over the walls. And pictures printed off the net. I bought their first album, No Pads, No Helmets, Just Balls and their DVD, A Big Package For You. There was a point when I became so obsessed with them that I was up at all hours of the night, writing, and watching stuff on the net, and that made my parents mad, because you know ‘you’re wasting your time and should be concentrating on your studies’. But, I wouldn’t do it any differently, now. In fact…I’m still doing it. But, I live out of home now, so it doesn’t matter anymore. In the intervening years, I’ve seen them three times. The first time was in Brisbane, 2nd October, 2005. I went with a friend, we flew down from Townsville where I was living at the time. And, that was a great experience. The first paid concert I’d gone to that I actually remembered. My parents bought me tickets for my birthday. That first time seeing them, was great. They even played Perfect World, which fast became my all-time favourite Simple Plan song. Even today it’s still my favourite. In fact, despite all the music I’ve listened to since, it’s still my all-time favourite song, from any artist. And then, a long seven year wait until the next drink. Simple Plan were meant to make an appearance in Perth in 2008 for their self-titled album tour cycle. But, due to issues with the venue that did not happen. In that time I lapsed as a fan; I was a little angry, and got drawn to heavier music [i.e. Avenged Sevenfold, though that’s an entirely other story…]. They were never far away from my mind, though. Speaking of their self-titled album, it was the first album of theirs that I was part of the process of waiting on bated breath for. I remember their internet promos, the vlogs, the web chat before the release of When I’m Gone. I think I played the preview of that song over 500 times… I remember falling in love with Your Love is a Lie [my favourite off Simple Plan] when they played it on the YouTube New Year’s 2007/08 concert. Then the album was released and though it’s not my favourite of theirs, it had a different sound to SNGA, it’s still an album I can listen all the way through without skipping a track. And it marked a part of my music loving life as the band has done a lot over the past ten years. And, still the wait to see them live again. In-between times, I moved to Perth, saw Coldplay twice [2006 and 2009] and other artists as well [John Farnham, The Eagles, Ronan Keating, Tina Arena]. But, I was always hanging out to see my favourite band again. Then Get Your Heart On! was released. They toured Australia for promo in 2011, doing the East Coast. Which bummed me out, but when they announced that they were doing a full ‘national’ tour in 2012 [that didn’t include Perth, but did include Townsville…go figure] I decided I wasn’t going to miss out. So, for the second time in my life I hopped on a plane to see a band live. This time with a soundcheck party place under my belt…because I finally, finally got the chance to meet them. That was the best concert, ever. And I didn’t think they could beat it. But, then, in 2013, they came to Australia for the ten year revival of Warped Tour in our beautiful country. As is usually the case, Warped Tour didn’t come to Perth. However, Simple Plan did. To make up for not coming in 2008. And, honestly, what a way to make up for it! Just before they touched down in our lovely land down under, they released an EP [their first ever], Get Your Heart On! – The Second Coming. Can I tell you, this EP has to be the best thing they’ve released [since SNGA]. And they performed one of the songs from the EP at the show in Perth. The highlight of that concert for me, though, was getting to meet them again after the show [thanks to an acquaintance I made through the band]. The time I spent with them proved to me once and for all how much us fans mean to them, and how down-to-earth they are. Being in a band has not made fame go to their heads. They’re five young men who do what they love as a job and haven’t lost sight of where they came from. And now , as they currently write for their fifth studio album, I am excited to continue being their fan, for as long as they are around. I have all their albums, including all official live albums. I have most of their singles. I have the book they released in 2012.